Like many Americans, my son and daughter-in-law have a particular passion for cocktails. They experiment with cocktail ingredients that maintain one another’s roots, traditions, and flavors but create interesting twists by mixing together different ingredients. 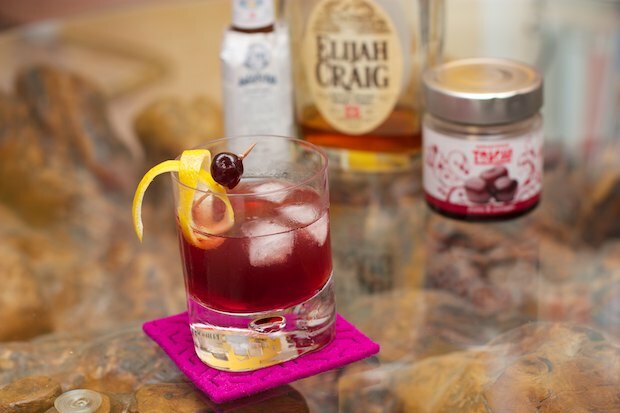 The cocktail that I propose transforms a famous New York cocktail using a traditional ingredient of the Italian pastry shop, amarena cherries in syrup. The amarena cherries used in this recipe are made by Toschi from Vignola. Over the past few years in Vignola there has been an extensive cultivation of cherries for the Italian market. I don’t usually drink but I think that sometimes at end the dinner this cocktail (if you’re among adults) may be a way to close a cheerful evening. In individual glasses, add the 3 tablespoons of amarena cherry syrup then add in the 5 drops of angostura bitters with 3 ice cubes and stir. Add the bourbon and water and mix again. Finish with the lemon zest and serve.